style="text-align:center;"> Please note that this topic has not had any new posts for the last 2541 days. I had some really great advice about my MINT card on one of my other threads, which basically suggests they've sent a defective DN closely followed by a termination letter. Also in the envelope was the current T & C's of 09/09. Could anyone wiser than me have a look over it please? While I'm certainly not wiser, that "agreement" looks a little flawed to me. It is devoid of any key terms. Do the separate terms contain your signature? 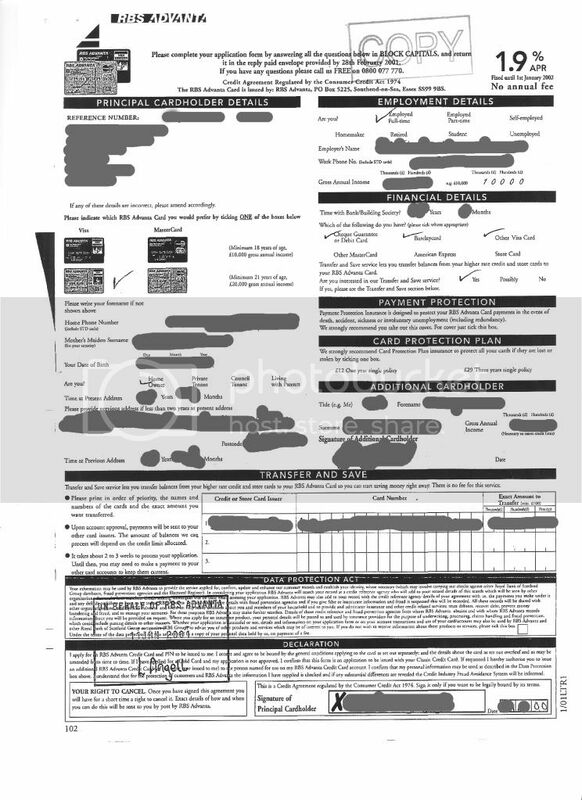 The application form does state that you agree to the terms as set out separately which means they would have to prove you received them at the same time as the application. That isn't going to be easy. One other thing. 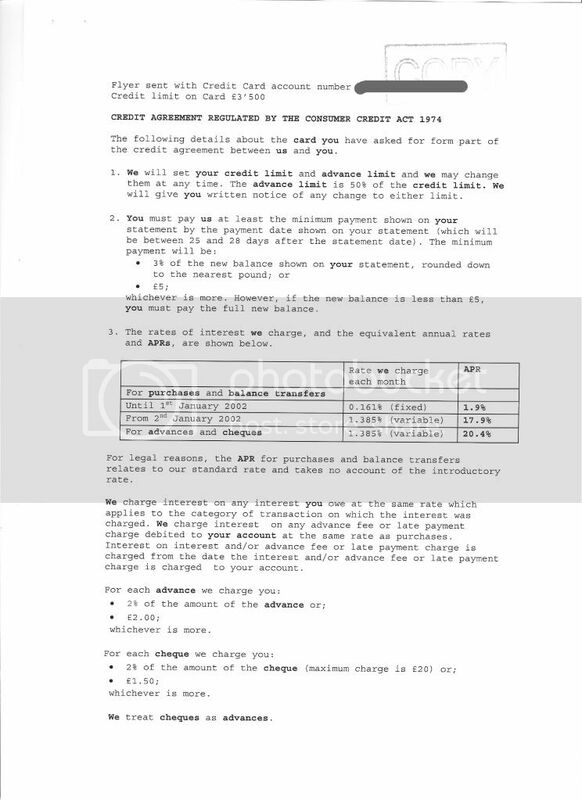 In the covering letter, they state they have received the fee and applied it to your account. That fee is for them and not to be used to help settle the debt. Hold fire for more peeps to comment. No, my signature only appears on the application form. The T & C's look to have been printed off a pc, probably from a database. I don't recall getting any with the application form. Anyone else care to have a look for me? What Silverfox says is quite interesting, but would appreciate further comments. I have something similar, how did you get on ? actually, I've not heard anything more from them since they sent this "agreement". Hopefully someone might see this thread who knows more than I! Although I didn't write accepting their unlawful recission of the agreement (although I understand I'm not obliged to do so), I have continued to pay the pro-rata amount I originally offered. 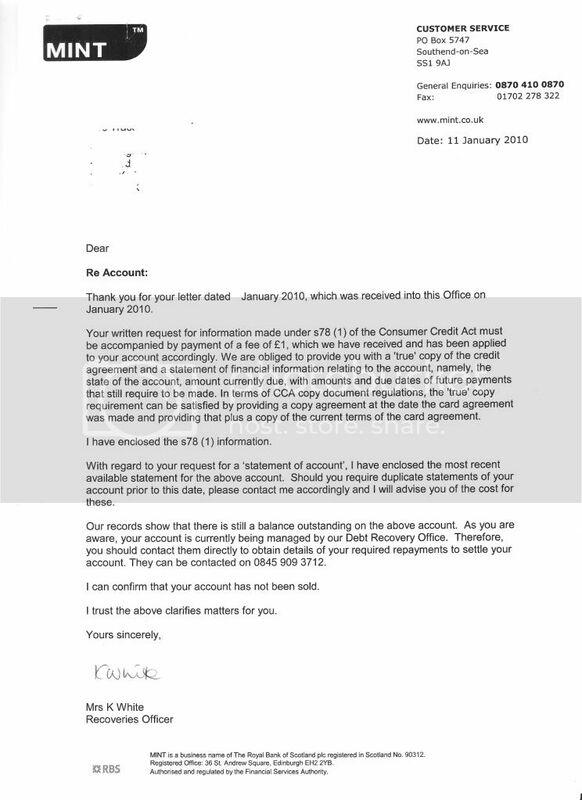 following your unlawful recission of the account last year, by my calculations I have now paid £75 towards the arrears figure quoted in your termination letter. I'm not an expert so sorry can't advise in this instance. Battling with Mint because they sent a postage size copy of the CCA and have now handed to a DCA who are threatening me. It looks as if you are missing the reverse of the credit card agreement. 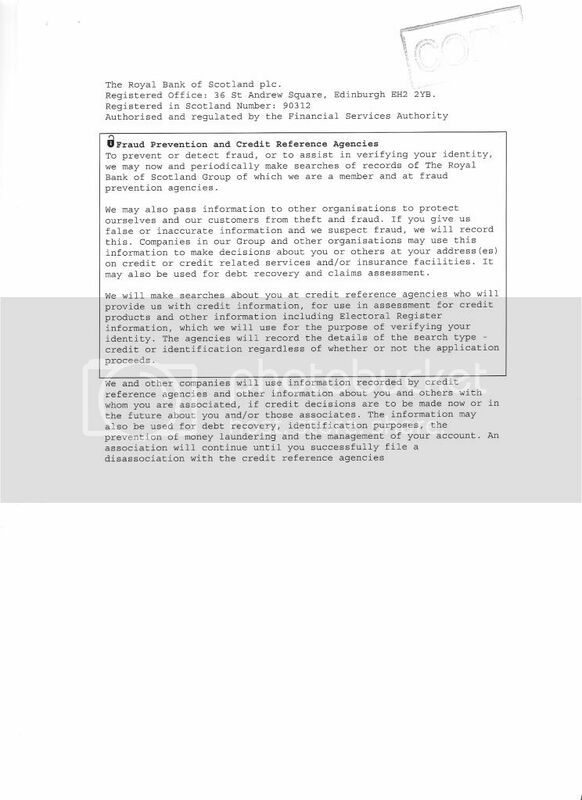 The document which follows your link to the front, would appear to duplicate the text on the front - so that's not the reverse. 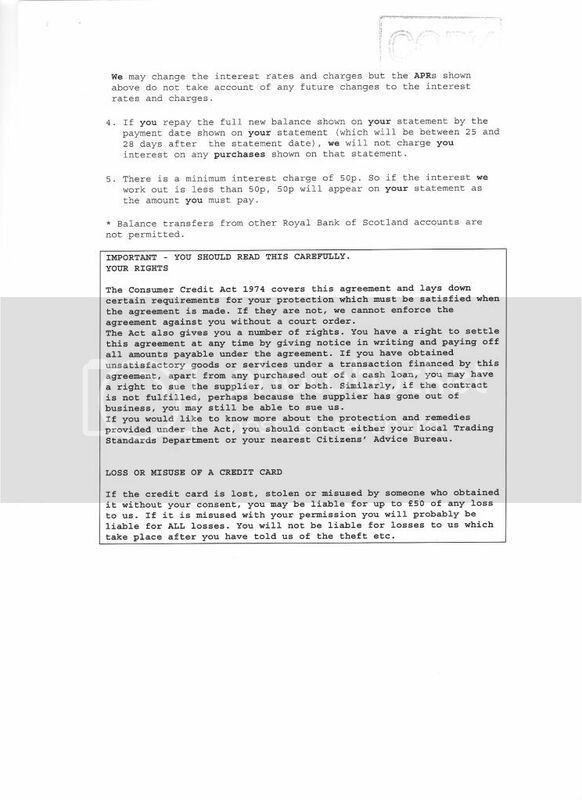 The other information appears to be a copy of the Terms & Conditions at the time of applying for the account - whilst it says that you agree to be bound by the Terms & Conditions for the "executed agreement" to be properly executed all the prescribed terms have to be in the executed agreement itself, and cannot be separate. So at the moment it's a fail for RBS. Enron, apologies for not coming back to you - this case fell off my radar as you can tell by the dates!! over the last 2 years, I've been receiving random letters from DCA's, but all's been quiet for a good few months until today when a letter from Wescot arrived threatening a doorstep collection. Obviously I've fired off a letter saying I won't agree to an "appointment" with their agent, but it got me thinking. I initially challenged them on the grounds of unlawful recission, but I'm led to believe that that may not be sufficient to fend off court action now? If that is the case, could anyone confirm whether the "agreement" in the earlier post would be sufficient defence against any court action? I'm hoping they'll disappear for another 12 months, but would like to know where I now stand just in case I get a letter from Northampton!!! Hmmm - wescot now say that RBS complied with the CCA request so they want my repayment proposals. Just referring back to what Enron said in post #9, how best am I to respond to wescot's latest letter?